I don't think we can trust ourselves with a TV. I don't think the TV should be available in the house. Even the stuff that's clean is a waste of brain power. If someone personally happens to do kiruv on TV, let them do it in the studio and not have one at home! After a period of indecision, we ditched TV during the 1990's after the picture tube died. Nothing was lost except that our degree of familiarity with degenerate popular culture diminished---not a bad bargain! The kids adapted well; they had never really been glued to the tube beforehand. There are more than enough "pro-taiva" influences out there to contend with daily. There is no need to flirt with danger intentionally by bringing TV into one's own home. Today, the Web brings challenges analogous to those of TV, so anyone feeling tempted to take a walk on the wild side should stay far away from it. People have to know their own tendencies. Bob: I plan to follow your lead when my television goes. I don't watch it at all now. Given the great emphasis on shmiras einayim, is it possible for a chassid to turn network television today for even than five minutes without seeing an image that he should not be looking at? I don't think we can trust ourselves with a TV. I don't think the TV should be available in the house. Even the stuff that's clean is a waste of brain power. I disagree wholeheartedly. While there may be junk on television, there are also tremendous educational programs. My children and I have enjoyed many shows on Discovery and The National Geographic channel. And we have watched "junk" television. But the trick is moderation. That really is the bottom line. Having a tv for the occasional educational program is fraught with peril. Even in a garbage dump one can find an edible apple sometimes. Having said that, we do have kosher videos that play on a tv that has no cable connection or reception. 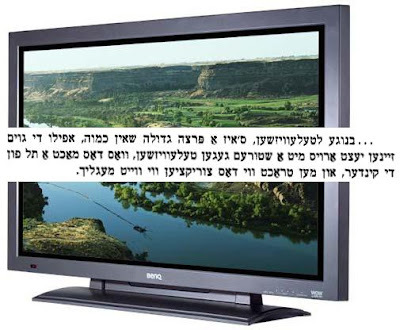 maybe we should "tell a vision" of the neviim, the prophets instead of watching a "television".